I was a weird kid. I loved spinach. It was always my favorite vegetable and I probably could have eaten it three times a day. I'm talking regular steamed spinach here, nothing fancy, no extras. My family is Italian from Florence and if there's anything a Florentine loves, it's spinach! We put it in soup, ravioli, torta and of course plain with olive oil and garlic. When I was older I got to taste creamed spinach for the first time and if I had a bad spinach Jones before , it only made it worse. Imagine my delight when stumbling across Punjabi spinach 20 years ago when I first started cooking Indian food. Actually it's referred to in most cook books as Punjabi pureed vegetables, but don't let the name throw you off, it's mainly spinach. 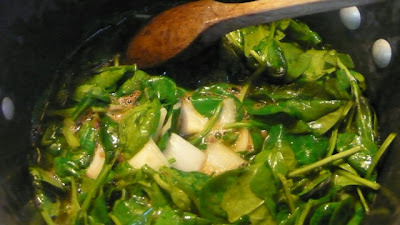 Lovely green creamy spinach, and surprise surprise, contains no butter or cream whatsoever so it's entirely vegan safe. Once you've had it this way, you'll never go back to plain old run of the mill green stuff with cream and nutmeg. 9.) 1 tsp of salt. Bring the mixture to a boil, then cover it and lower the heat. Let it cook this way for 1 hour. 10.) When the vegetables are soft, remove the lid and raise the heat to boil again. Cook it an additional 20 minutes or until most of the water has cooked away. 12.) Add in 1 cup of peas either fresh or frozen. Continue to cook for an additional 6 minutes or so until the peas are cooked through. 13.) add in 2 to 3 tsp of garam masala and salt to taste. Serve and enjoy the spinachy goodness! Popeye never had it so good. I order something like this but they will have paneer or cottage cheese added. YUM! My brother & I always ate our spinach because we grew up on Popeye cartoons. It's still my favorite green veggie and this looks like something I need to make! A different way to make the spinach. Looks really good! I loved spinach as a kid too, but I can only imagine eating it non stop if Mom had this yummy recipe at home. Sounds wonderful - you realize your blog is going to be an inspiration for all my future Indian cooking.